Active Period Bottleneck Detection – Solution. The graph shows the percentages each process is the bottleneck. 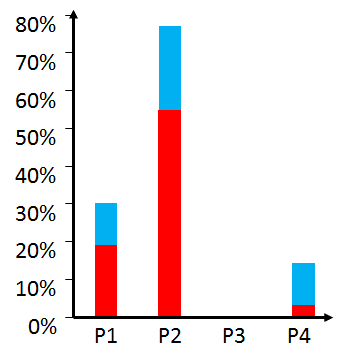 The red parts is the sole bottleneck, the blue parts are shifting bottlenecks. This image by me is licensed under the Creative Commons Attribution-Share Alike 4.0 International license. Please credit the image as shown below. For digital documents and web pages please do include the links as shown below. Thank you.